No. But we do recommend making reservations if your party is larger than four. Call us at 570 223-1700. We have gluten-free and vegetarian menus available. We’ll always do our best to accommodate special needs. Call us at 570 223-1700. What time are you serving until? Usually the last seating is between 9 and 10 pm. Are you a family restaurant? We have several rooms to accommodate small and large families for casual or fine dining. Having seven different dining rooms enables us to accommodate virtually all families. What are your daily specials/features? Our chef and creative staff feature at least four entree, appetizer and dessert specials each day. Where can I get private dining or banquet information? We do private dining for reserved parties of 20 or more and a variety of parties and banquets up to 90 plus people. Link to banquet page for more details then call 570 223-1700 ask for our Events Coordinator. Can you give me details about your Sunday Brunch? Do you have a private dining area or a quiet corner? Yes. Make sure you mention your preference to our host on duty or when making your reservation. Do you have a booth seating and TVs? Yes. Booths and TVs are located in the Tavern. We have most children’s favorites including: chicken fingers, pizzas, pasta, jr burgers, mozzarella sticks and more. Is your Marinara Sauce meat-free? Yes. We use fresh pack tomatoes and follow Grandpa Anthony’s original family recipe. What happened to the old Big A? Check out the slide show on the About Us page for a full history. What type of steak do you serve? Hand-cut Rib Eye, New York Strip and center-cut Filet Mignon; Porterhouse, Bistro Steak Medallions and Marinated Steak Tips. Plus you can chose from our various succulent steak additions. 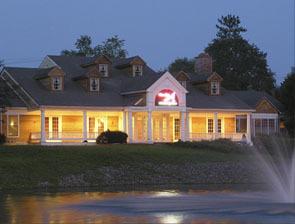 Come see why we’re the Best Steakhouse in the Poconos!